Unfortunately, I was unable to get out photographing this month and so have very few new images. The weather was very hot and humid and everyone was longing for some rain. 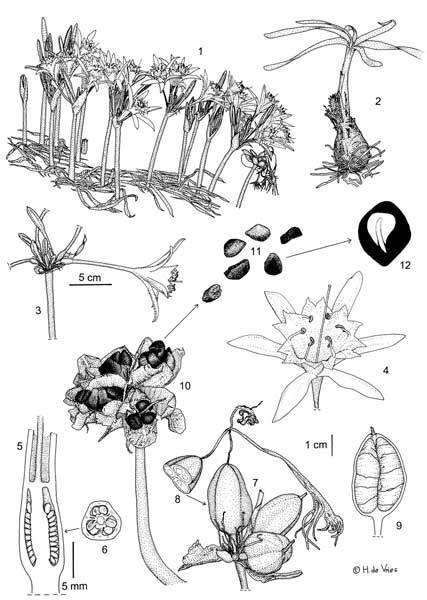 However, without new photographic images, I am more than ever grateful for the contributions from Hans and Jan with their works depicting Pancratium maritimum. I am including my work ‘Out of the Sands of Time’ once again this August, in order to complete a trio of very different styles. 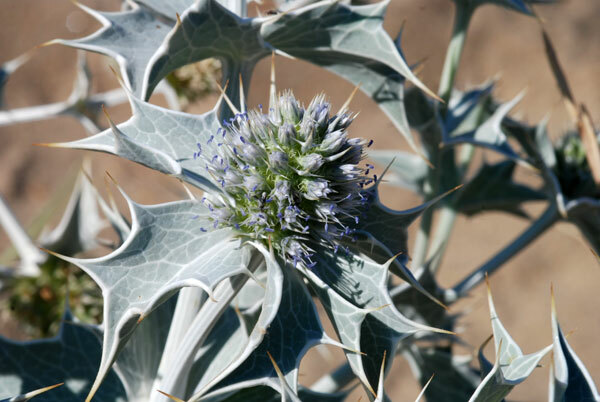 Eryngium maritimum / Sea Holly / Ερύγγιο το παραλλλιο / Stranddistel - The small, blue flowers of the Sea Holly provide a feast for hornets and bees and the hot air on the beach east of Malia was buzzing with the sounds of insects as I took this photograph. The shades of blue and lilac that can be seen as this plant matures are so wonderful and a delight to the eye. Out of the Sands of Time - Once again, my botanical painting of the Sea Daffodil Pancratium maritimum. This example was found near the beach showers at Malia and was one of the only specimens to survive the ravages of shampoo, treading feet and intrusive quad bikes. Sadly, when I returned to the spot this year, there were no plants to be seen. Please do not use soap or shampoo at these beach showers, these chemicals are very destructive to flora and fauna. 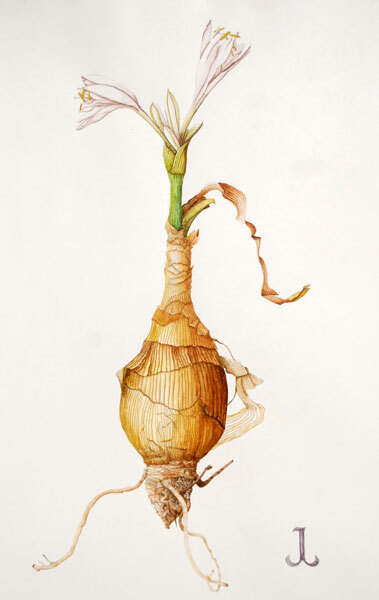 Pancratium maritimum (botanical illustration – Hans de Vries) - Hans’ excellent and very precise illustration of the Sea Daffodil, showing a degree of detail not possible in my watercolour paintings. 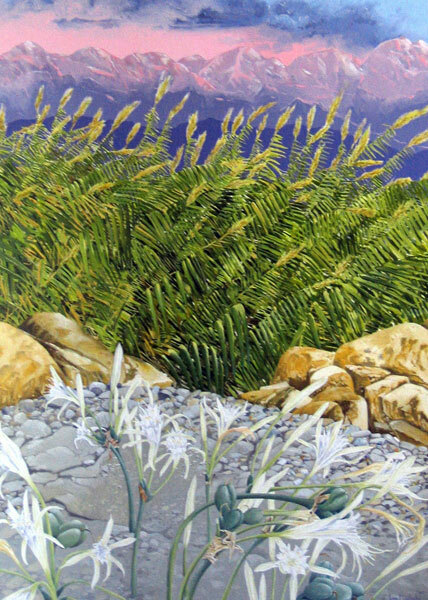 Pancratium maritimum (Jan Liodaki) - Showing a very different portrait of P. maritimum, Jan’s lovely painting capture the atmosphere of a beach scene where the Sea Daffodil still flourishes. 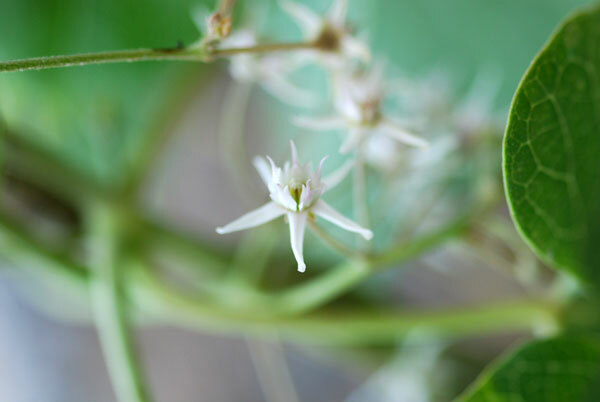 Cynanchum acutem - This delicate, twining plant was found on a coastal road near Malia. It can be found in damp areas, usually near the sea.